James Wallace is unlikely to be risked for Sunday’s FA Cup tie against Queens Park Rangers, Sheffield United manager Nigel Clough has insisted. But the Blades boss revealed earlier this week that Craig Alcock, who has been missing since the end of November with a back complaint, is back in training and could come into contention to face Harry Redknapp’s Premier League side. Wallace, who has seen a series of niggling injuries disrupt his progress since arriving at Bramall Lane in the summer, is back in training but Clough warned: “We’ll see how James does this week, but it’s unlikely that he’ll start on Sunday because of how long he’s been out. We don’t want to rush him back and risk another set-back. 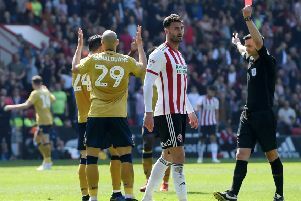 Clough will be forced to make changes, however, with centre-half Chris Basham still serving a three-match ban and loanee Paddy McCarthy having returned to parent club Crystal Palace. Striker Chris O’Grady has also been recalled by Brighton, meaning Marc McNulty will probably start up front.